GENEVA — Since retiring from the New York State Senate, Mike Nozzolio has been busy doing a lot of things he did when he represented the Finger Lakes region in state government. Primarily, that means promoting it. Last summer, he announced that he was joining forces with Auburn businessmen and brothers Jack and Jerry Bisgrove on an initiative that had the working title of the Stardust Finger Lakes Initiative. Its goals: to promote the entire Finger Lakes area and to build business and career opportunities. The latest incarnation of the enterprise is being called Locate Finger Lakes, and Nozzolio will be at a press conference Wednesday at Geneva’s Ag Tech Park to unveil a new website along with Facebook and Twitter accounts all under the Locate Finger Lakes brand. A large part of the website’s purpose is to let people know what’s out there — in terms of jobs and job training, economic and business opportunities, even scientific research. Accessible at locatefingerlakes.com, some of its links include “Financial Assistance” and “Early Stage Financing” for businesses, “Internships” and “Colleges and Universities” in the area. 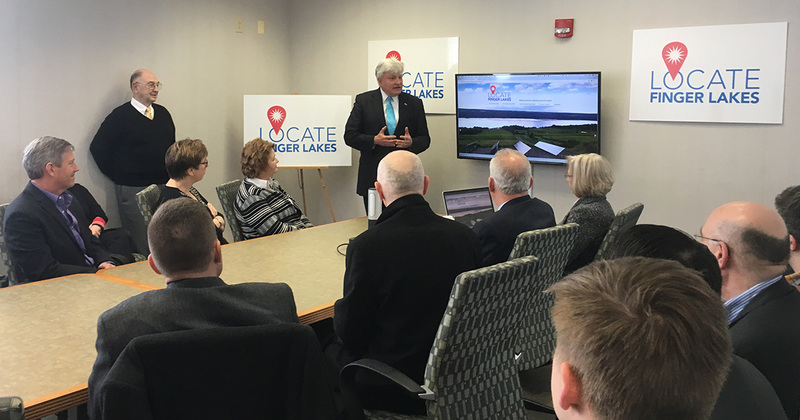 “It is our hope this new website and our continued work at Locate Finger Lakes will assist those individuals and organizations who are working diligently to enhance the development of positive business opportunities in our region,” Jack Bisgrove said. The initiative is based on collaboration with a number of community and academic partners including Cornell’s College of Agriculture and Life Sciences Director Kathryn J. Boor, Danny Wegman, and Seneca County IDA Executive Director Bob Aronson. In addition to the new website, Locate Finger Lakes can be contacted by phone at (315) 577-3796 or followed on Facebook at @LocateFingerLakes or Twitter at @LocateFLX.